Yesterday was the day hunters in North Dakota could begin blasting away at pheasants. A couple years ago, after thinking things through a bit, I decided to purchase a sensibly priced double barrel shot-gun to take up seasonal bird hunting. And in the last week, I ended up meeting and briefly chatting with Hank Shaw, the chef and author of the cookbook, Duck, Duck, Goose. Shaw is one of the latest recipients of the James Beard award, and he’s got a spectacular blog here. Hunting isn’t like going to the grocery store. If you happen to shoot something, you have to gut and field dress whatever it was that you killed. In the case of a bird, this requires you to hold the still-warm bird in your hand while making the right incisions to access and discard the guts. At least for me, it helps recenter my psyche, and I feel a bit more re-attached to the realities of my diet. This is much different from purchasing a saran-wrapped cold chicken in the meat and poultry section of your grocery store. And when one is hunting, there is never a guarantee that a hunter is actually going to return with something dead to eat. That ended up being the case yesterday. But as you’ll often hear hunters say, it’s often not just about the hunt. It is also about walking tree rows, getting out into the landscape, and just looking around at what’s out there. 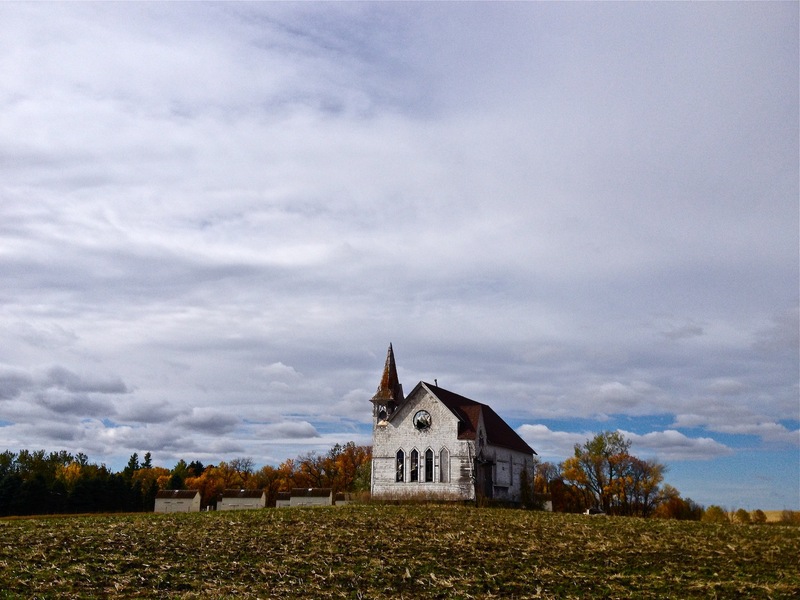 An abandoned prairie church near Enderlin, North Dakota. Photo taken on October 12, 2013. Rick Gion and Christian Gion and myself made up our entire hunting party. Rick and I brought our shotguns while Christian opted to hunt for edible mushrooms. Christian got a small bundle of oyster mushrooms and some seriously ripe buffalo berries. When Christian returned with the berries, it reminded me that this was also the seasonal plant northern Great Plains Dakota and Lakota indigenes would pick at this time of year. Christian ended up returning with more than Rick or myself (which means Rick and I returned with zero birds). We did find some good spots for next time. Abandoned prairie churches on the northern Great Plains really catch the eye when one is out hunting upland birds. Bottom part of the photo is mono-industrial agriculture; the abandoned gothic church architecture is a stratigraphic slice of a time gone by; and the top 3/4s of the photo is the skyline typical of our North American steppe. So the hunt wasn’t a total loss. At least I got to shoot something, if only a landscape photograph.